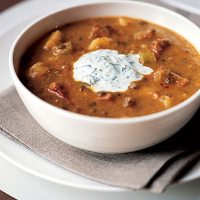 Spanish chorizo sausage and chilli paste give this hearty soup a spicy warmth that is balanced by a cooling coriander raita. Serve with crusty bread for a more substantial meal. Rinse the lentils and cook in boiling water for 10 minutes. Heat the oil in a large saucepan and gently fry the chorizo, onion and celery for 5 minutes. Add the parsnips, stock and hot chilli. Bring to the boil then reduce the heat to a gentle simmer. Drain the lentils and add to the pan, cover and simmer very gently for 15-20 minutes until the vegetables are tender. While this is cooking, mix together the coriander and yogurt, and put in a small serving dish. Using a hand-held blender, lightly blend half of the soup and add to the rest, so it is thick and chunky. Ladle into soup bowls and serve with the yogurt mixture.